I always begin by letting go of all preconceived ideas and getting into this moment with YOU, my life. 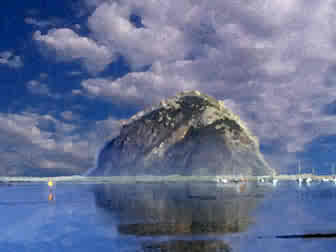 As I walked in Morro Bay I was getting into a Fresh mood by walking over to where the waves were crashing against the rocks. 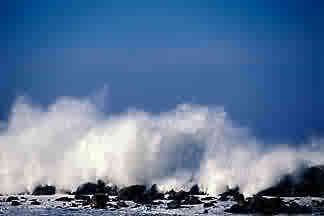 Splash was a synch related to freshness with Spirit and the original intent of baptism. Every thought layers your eternal home like a shell or a cameo. I walked into a shell shop with Pam and the lady and I began to speak. After I talked to her about synchronicity she wanted to show me what she had been having deep thoughts about. She showed me this poem about the sand dollar. And proceded to break a sand dollar to reveal the doves. 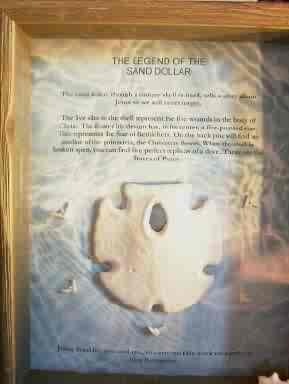 "The sand dollar, though a unique shell in itself, tells a story about Jesus so we will never forget. The five slits in the shell represent the five wounds in the body of Christ. The Easter lily design has, in its center, a five-pointed star. This represents the Star of Bethlehem. On the back you will find an outline of the poinsettia, the Christmas flower. 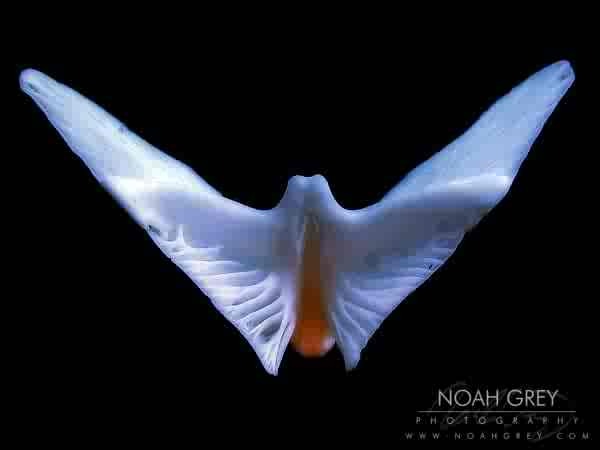 When the shell is broken open, you can find five perfect replicas of a dove. These are the Doves of Peace. Jesus lived for you and me, to carry on His work on earth, to love humanity." This is related to the Star, sand dollar, shell etc synchs and the "true intention of the heart" when I say to my daughter Sarah that " A star will lead you back to me." 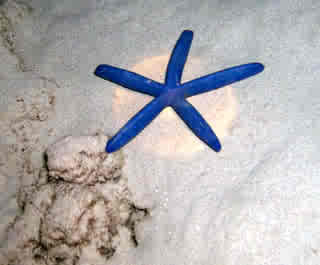 I bought a blue starfish as I was having synchs to put on my table and dream about. Cameos ­ layered low relief carvings in stones or shell, often on a colored background ­ were first created in ancient Egypt possibly in the 6th century B.C., but other countries and peoples soon fell in love with them. The Greeks, Romans, Persians, French and English were all adept at cameo carving. The form you call yourself is really only the outermost layer of the cameo, the skin. A subtle focused intent and what rises to the top (creme). YOU are the creme that rises to the top spirit. She is a creme box. She is my treasure. Other synchronicities with box were "Little Women" when they found the box of treasures related to one who passed on. Box or Ark of the covenant. Again like a 3d block that my life has assigned an experience or word to each pixel and when I ask for something a word in poetry that my life can understand stands out. It is the music of my life, the vocabulary of my experience. Like when I dreamed of heart and dna I got synchrocities with pearls roses cameo's layered things. Now within your experience when you think of these things other pictures and poetry may begin to appear because of your past experience. This is how we talk between dimensions. Or other being speaking from other worlds put forth a thought and your mind goes to the closest poetry to match. Some of the other synchs while on this trip were related to remembering and the Layers of Dna. Now the synchs that I have are related to memories within the DNA. This is my body DNA which is given to You, do this in remembrance of me. Forms given to cause remembrance. As with the rainbow and Noah, forms are given as poetry to remember the experience when they were created. Such as the flood and the promise. So it is when you have a synch with a form such as a cameo. When we were having the form synchs with the shells and given to remember such as the bread and wine the commercial with "value the rainbow" came on and the thought about the remembrance and Noah. We read the relationships of the sign of the rainbow, the sign of Jonah, the sign of the Cross, the sign of the bread and wine. For these forms are given to remember. Not as those that have the letter and misinterpret but one that reads the book and puts it down only to leave it to the spirit through their living to fulfill. The bowl synchs related to food and rescue and synchronicity. We were watching Adult Swim cartoons in a motel and it was about every time the kid would receive a bowl of rice he would have calamity come upon him. another Jesus quote before the experience of a lifetime. "Abba, my Father, all things are possible to you. Take this cup away from me; yet, not my will but yours be done"
Before the Hurricane I gave MisterLady a PM and posted about the face (soul) in the bowl. (spaghettios, Mr. Magoo, smiley) Also the media has used the word bowl to describe New Orleans. Water, soul, bowl. Other related synchs. Shadow incarnations (adult swim) related to the rice bowl. Disaster/ opportunity same word in Chinese. Water fall synchs, two waterfalls happening on tv on two different channels where they fell a long distance (kayak) but survived well. Other synchs: The humility and love needed to hear from Spirit is related to a husband that is rejected by his wife and she slams him. She wonders why he never communicates with her again as he does not want to feel the negative emotion and wants to put it behind him. In the same way if you slam or reject the bum on the street "You have done it to me" so you do not hear from the bum or the spirit. The humility needed to open up to the Spirit is the same as loving the bum on the street for you listen to them looking for the love and synch from the Spirit. The last will become first. So Dogma Separates/ Love Integrates means that the dogma that keeps religious people rejecting You in your true experience with Spirit is related to why they are rejected by Spirit and that True Love (not contrived love which is the majority of what American women worship) True Love is being open to the Spirit in every person and everything and learning to recognize that voice. True Love only looks for spirit and does not point out the failings of others as the smallest of points overlooked will reveal the failings of Interpretation. Your moments in wonder, reveal the true intentions of the heart. The smallest of points overlooked changes entirely everything and renders all interpretations meaningless.